Why do we always have to queue in this country? It seems that we are a nation that is obsessed with queuing for just about everything. I know, it's the British way and we have always done it. I can see how foreigners however, might find it all a bit irritating. I think it kind of hit me the other day, when funnily enough I was standing in a queue at the bar, that we really spend a lot of our lives doing this. I don't mean we spend a lot of time in bars, although that happens to be very true as well! We stand in line for just about anything. Supermarkets, bus stops, taxis, the post office, the cinema and just about anything else you can think of will attract a line of people. Why is it that it is considered appropriate to queue in some countries and not in others? For example the Chinese are notorious for queue jumping, but Russians who have experienced poverty and food shortages will queue quietly for hours or even days without complaint. Queuing is a really bizarre thing when you think about it. But it is polite, and maybe that is why we British hate queue jumpers. Queue jumpers by the way, are something we deplore even more than the queues themselves. If you want to upset an Englishman, just push your way in front of him whilst he's queuing for his fish and chips! Here's a though. I'm surprised us Brits haven't found a way of making visitors queue to view pages on a web site. There again, maybe we have if you have ever been to the BBC News site around lunchtime. Other cultures queue as a custom. It's not just Britain. The foreigners in London who jump queues are just ill bred and think that's how you behave in London as the British are too polite to get annoyed. As well as queue jumping standing yards behind the person in front is a no-no and invites queue jumpers. When the queue moves forward so do you and you should not have more than three feet between you and the person in front. I recently visited London for the first time in over 20 years; I felt I spent much of my holiday in queues for just about everything! When I last visited, I didn't recall ever queueing up anywhere near as much as I did on this visit. For an impatient, fast-paced person like myself who doesn't like queues and is very driven by time, the frequent, lengthy queues was quite frustrating. The lesson learned on this holiday is to schedule more time for each activity given how long and slow many of the queues I encountered were. I, personally like to make a quite (note: loud enough to be heard) comment to the person behind me when someone queue-jumps. Or I simply say 'excuse me?!' in that one way all Brits would recognise as the 'affronted, but not going to mention it anymore' voice. Yes, quite. I joined a queue once by a store sale (I know the queue was long before I joined it BUT people who take kids to long lines are the worst,some people waited 20 hours or so, 12.00 am til 8.50, I forget which . They parked miles away & walked everywhere , I came to work one day and somebody had queued outside my shop, anyway I know the problems it causes. Because there are too many people and not enough services! Simple. This is exactly what will happen when everybody is on the dole. Queuing makes perfect sense, but like one post at least has already said bus queues in London have virtually disappeared as more and more immigrants are living in London. Queuing is not a part of many foreign cultures. However, people coming to live in UK should be prepared to accept our way of life so as not to offend us, we would be expected to do the same should we go to another country. About a year ago a Nigerian looking guy walked right to the front of the queue I was standing in, the bus arrived shortly afterwards and he hopped in front of about a dozen or so people that had waited in turn for the bus, he got one of the seats that should have gone to someone else. I politely pulled him up about his actions and the vitriol he spat at me was enough to make me ignore him and stand well away from him. And, just last night a Chinese guy did the same at the same stop, after a year of watching people do this I said something again, and he replied 'F**k You. You get off same stop as me and we sort this out' I'm a 23 year old woman, 5foot 1inch tall, I don't think so. Brits are saying nothing because this is the kind of response we can expect. I don't understand why anyone wouldn't queue. Why should someone who's just arrived at the bus stop get on the bus before someone who's been there 10 minutes? I'll happily wait in a queue if it means everyone's served in the order they arrived! If there are two cash points, should each machine have its own queue or should there be one queue for both? And unfortunately, I've also noticed that not every queue jumper I've seen is foreign. We have queue jumpers who are British born and bred. How scary is that?! Oh please! 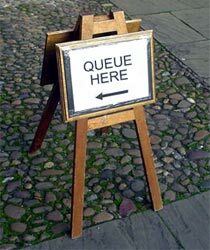 I'll eat my right arm if I EVER see a British person call out a queue jumper! I see queue jumpers every day waiting at the bus stop. I'm usually the one who complains, usually TO the queue jumper, and I'm the "irritating", "fat", "always happy" American. I hate queue jumpers. I was brought up in the States to wait my turn which required that I wait in line. It's just common courtesy and respect. If someone else was there before you, they go first. If there's a queue, get in it. Some people just have an over-inflated sense of entitlement. If only the whole world knows the meaning of queuing up. During my university years, I always had to endure other students crowding themselves to get into the bus. Not just the bus. There is the train too. Yes, people are busy and have no time but at least sacrifice some of the time to queue up. Is it that hard?